What is the LG Rolling Bot? It’s a few things. A remote controlled toy. A home surveillance camera. An entertainer for your cat. We kid you not – this is LG’s crazy creative juices in full flow. LG didn’t even intend to launch the Rolling Bot, but it was so well liked internally they decided to treat the world to it. 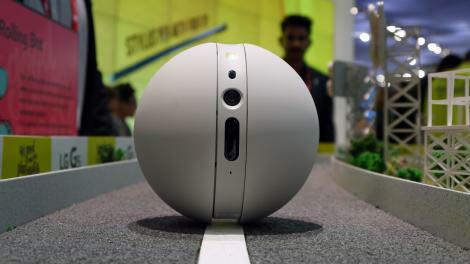 Perhaps the success of Sphero BB-8 encouraged LG to make its own round rollable a reality. The white plastic sphere comprises of two domed wheels bolted onto a central circular control unit. Slightly smaller than a bowling ball, the Rolling Bot looks like it could belong on the set of iRobot. It feels pretty tough, but LG recommends not dropping it from anything higher than about a foot – so don’t go running it down the stairs. You control the Rolling Bot with a smartphone app (available on Android and iOS), and with its built-in 8MP you get a visual from the robot as you drive it round your house. You can take pictures and record footage, and the Rolling Bot can connect to your home’s web connection allowing you to control your bot from anywhere in the world. This means you can check on your home to ensure everything is in order, although it probably can’t fend off an intruder. It may help put them off though, as the Rolling Bot also has a built in speaker. LG’s positioning this particular feature at pet owners, who can check up on their beloved animal when they’re out of the house and offer them a few word of comfort – or simply shout at them to get off the sofa. Of course, I’m sure you can think of other uses for the speaker. There’s an added bonus for cat owners too, as the Rolling Bot also has “Pet Mode.” Once activated in the app the Rolling Bot will move around by itself while shining a laser point for your moggy to chase. Why? Why the hell not? The Rolling Bot runs off 512MB of RAM and a 5000mAh battery. It knows when it’s getting low on charge, and will go and park itself in its charging dock when it’s nearly out. If you think the white paint job is a little dull, then there’s good news – there are ports on the Rolling Bot specifically for outfits. The example on the LG booth was bunny ears and a fluffy tail. We can’t wait for the BB-8 mod. There’s no word on pricing, and it’s unlikely to be particularly cheap, but the LG Rolling Bot will be out later this year. It may not make sense, but the LG Rolling Bot doesn’t need to. That’s its charm. This is a product that was never intended for general release with a seemingly random feature set, but somehow it works and I want it. I just hope I can afford it.